If money (amongst other things) weren’t an obstacle, Max Germanos, of 3:33 Art Projects, jokes that it would be “cool” to own the Mona Lisa. ‘Cool’, perhaps, is an understatement befitting the prospect of owning what is perhaps the most famous work of art in the world, but then again, he isn’t wrong. Jokes aside, he says, he’d love to add a self-portrait by one of the German expressionist artists of the 1920s and 30s, like Max Beckmann or Christian Schad, to his collection. There is, of course, a considerable element of fantasy underpinning the musings of Germanos, an avid collector and the well-versed curator of this year’s Collectors’ Space exhibition at Roslyn Oxley9 Gallery, one of Art Month Sydney’s most popular features of which Germanos himself is an alumni. 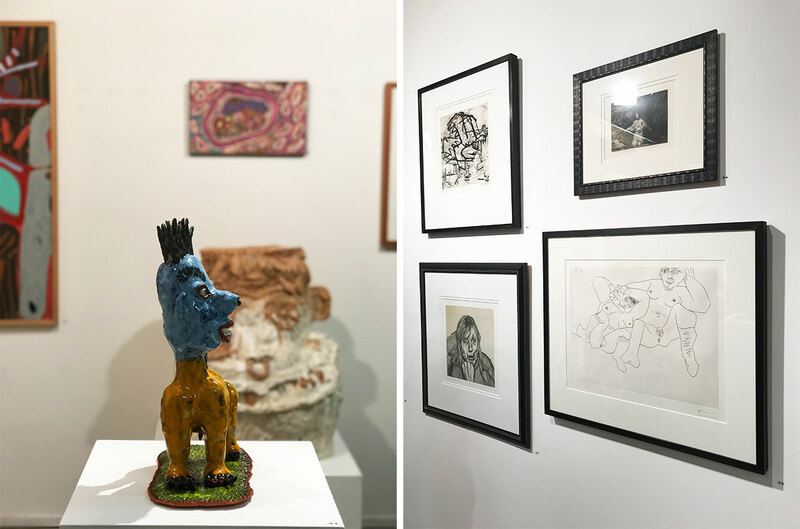 The show, which today enters its final week, draws on the collections of four Sydney artists (and collectors in their own right) for an enlightening show that pulls back the veil on the concept of ‘an art collection’. What may seem at first like a daunting prospect for any number of reasons is cast in a new light by the show, which includes paintings and sculptures drawn from the collections of Nicholas Harding, Del Kathryn Barton, Lara Merrett and Ramesh Mario Nithiyendran, alongside pieces from the artists themselves. Intrinsic to the exhibition is the idea that many artists, even the most financially successful ones, can’t afford to amass an extensive collection, so what they do acquire is often subject to the practice of ‘swapping’ with another – a practice that oftentimes is something of a gamble. But for those of us without the contemporary art world connections, what are some of the realities of starting a collection? Where does one start when time comes to begin a collection of one’s own? Research is key, says Germanos, who, once captivated by an artist’s work, then begins a deep dive research process into the artist’s pedigree (with a view to assessing how it affects the price of a work). Where and for how long an artist has exhibited, other collections their work is included in and if they’ve been the recipients of any major prizes can all come into consideration here. But that can all mean nought if you aren’t assured of your own tastes. “Art is subjective,” says Germanos. “I would advise first time collectors to spend time looking at art to determine what appeals to them. Get familiar and trust your own instinct. Take as much time as you need but also spend time online, [on] social media following artists and galleries. 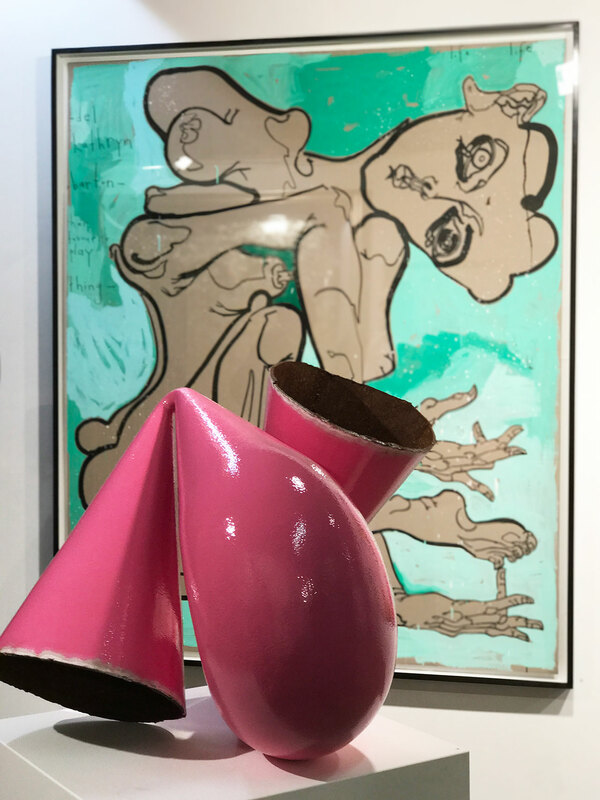 Go to art fairs and, of course, Art Month offers so much for new and established collectors. It’s a sentiment echoed by Harding, an acclaimed portrait artist whose collection includes incredible works by Mike Parr, Lucian Freud, Pablo Picasso and Francisco Goya, all of which feature in Collectors’ Space. “Buy art that you want to live with”, says Harding. “I don’t really ‘look for’, the work finds me. I feel a ‘hit’ when I encounter such a work and following that initial response something continues to resonate, keeps pulling me back in. It’s important to see and feel a ‘vision’, a way of encountering life and a compelling and exciting exposition. COLLECTORS’ SPACE IS ON AT ROSLYN OXLEY9 GALLERY IN PADDINGTON UNTIL MARCH 16.